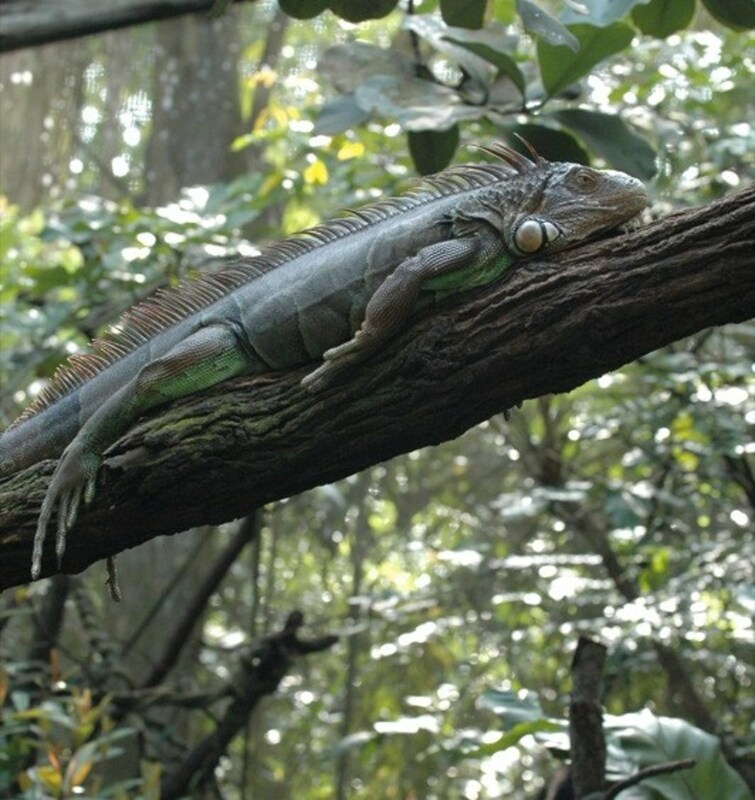 Whitney has extensive domestic animal husbandry experience and has cared for various species. When housing any pet, it's always good to make sure that you can meet the proper requirements before you bring home the pet. 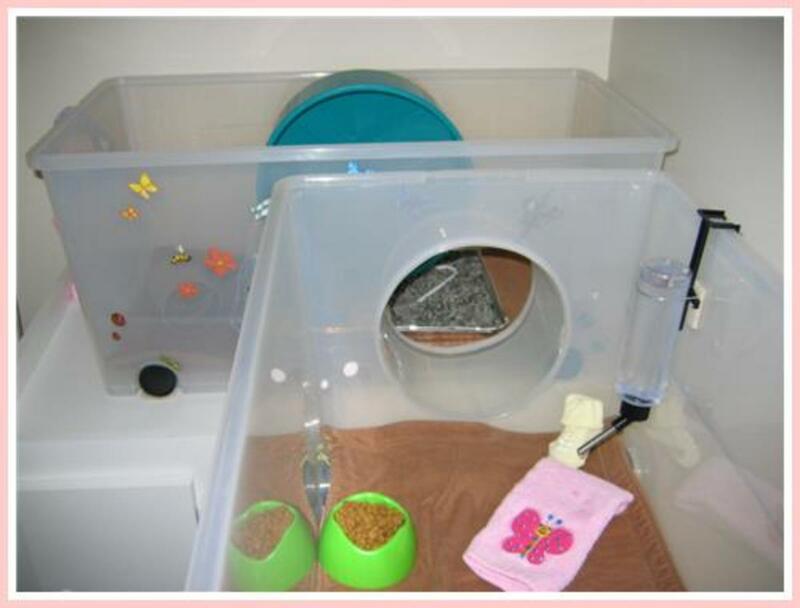 It's very important that your are able to provide the ideal enclosure size, accessories, and substrates so that your potential pet can thrive to the best of your ability. When caring for hedgehogs, the housing requirements are not well known to many as hedgehogs are still fairly new to the pet market. It's thought that the following housing instructions, are the best known to housing health hedgehogs. First remember, that hedgehogs are best kept as solo pets per enclosure. That means you only want ONE hedgehog in each enclosure, and you definitely do not want to house two males in one enclosure. Typically, the larger the enclosure, the better off you will be. Some people prefer enclosure sizes that are bare minimum 16"W x 24"L whereas others believe that the smallest the enclosure should be is 24"W x 30"L.
Just make sure that you do not use a small aquarium. Some people will even claim that a 20 gallon long aquarium is sufficient for one hedgehog, but remember that hedgehogs will roam rather large areas of land in the wild. It's best that the enclosure does not have ledges, or multiple levels, as hedgehogs are ground dwelling animals that do not have good height perception. They will easily fall off a ledge and can easily become hurt, so if you opt to include ledges in the enclosure make sure they are low to the gound. You also want a solid floor because hedgehogs have very small feet and they can get their feet stuck in the bars, and it's also difficult for them to walk on wire floors, even if the wires are very close together. There are generally, three different types of cages that you can consider; check out the major difference and pros/cons for each before you make your decision as to which one you would prefer for your hedgehog. Wire cages are great for ventilation and probably one of my favorite types of enclosures, but you just want to make sure that the bottom of the cage has a solid tray; hedgehogs have tiny feet that can easily get caught in the bars. 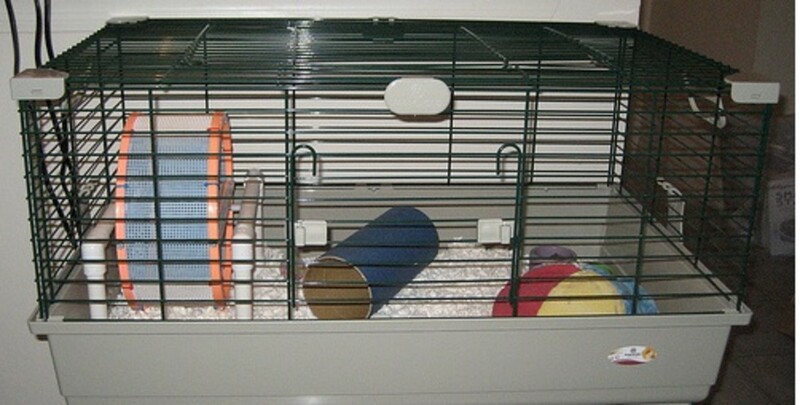 You also want to make sure that the wire bars are closely spaced together so that your new hedgehog can't escape, and that the cage is fully enclose, even though hedgehogs aren't the best climbers, some will be adventurous and try to climb out, which is also why the cage should not be any taller than 14" ito prevent potential climbing injuries. 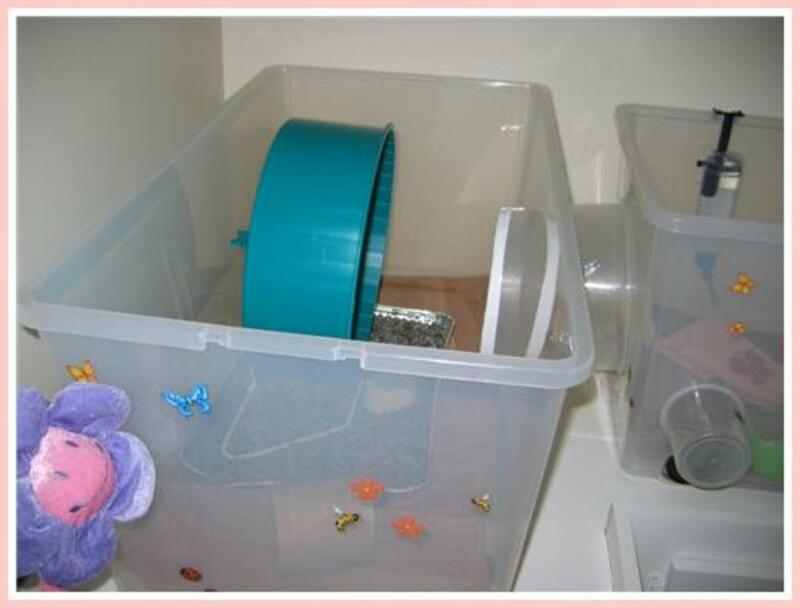 Plastic storage containers by Rubbermaid or Sterlite are easy to clean and easy to find. You would need to drill holes in the container to allow for optimum air ventilation. Some people prefer the darker storage bins, which help keep the cage darker during the day, while the hedgehog sleeps, but in this case, you want a clear lid. 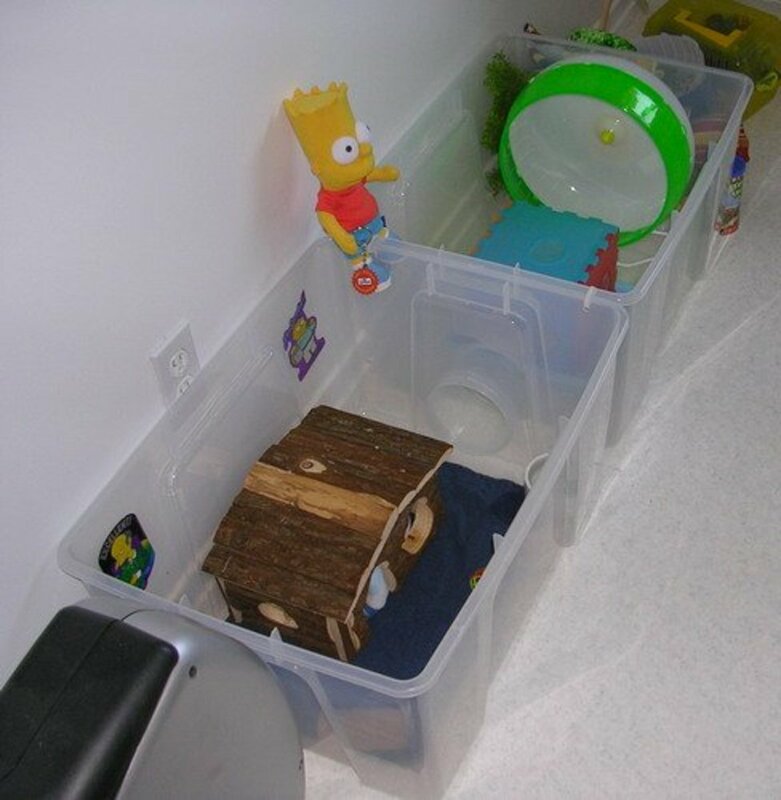 You can actually keep the lid off the enclosure as long as you do not have children or other pets who can get into the container. If you opt to leave the lid off, you want to make sure that the walls of the bin are at least 12" tall and that the hedgehog cannot climb on any of the accessories in attempt to escape. Aquariums are preferred by many because they look nice and allow for easy viewing of the hedgehog, but they can be heavy, hard to clean, break easily, and provide poor ventilation. If you opt for an aquarium, you'll ind that bare minimum is a 20 gallon long, but floor space really is important, and a 20 gallon tank doesn't provide all the necessary space. 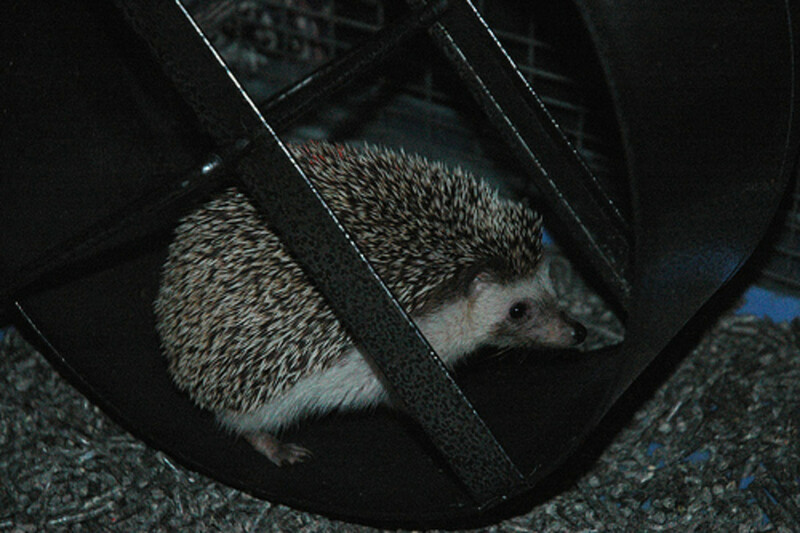 Also consider that many people who use aquariums will find that hedgehogs will frequently experience cage rubbing where they rub their face on the glass wall and cause bleeding; you can prevent this by covering about 6 inches of the bottom of the glass with something solid, such as cardboard, poster, or thick paper, so that the hedgehog can't see through and think he can keep going. It's a good idea to place the enclosure in an area where the hedgehog can get about 12 hours of sunlight, but you don't want to put the enclosure in direct sunlight, as this can potentially overheat the hedgehog. 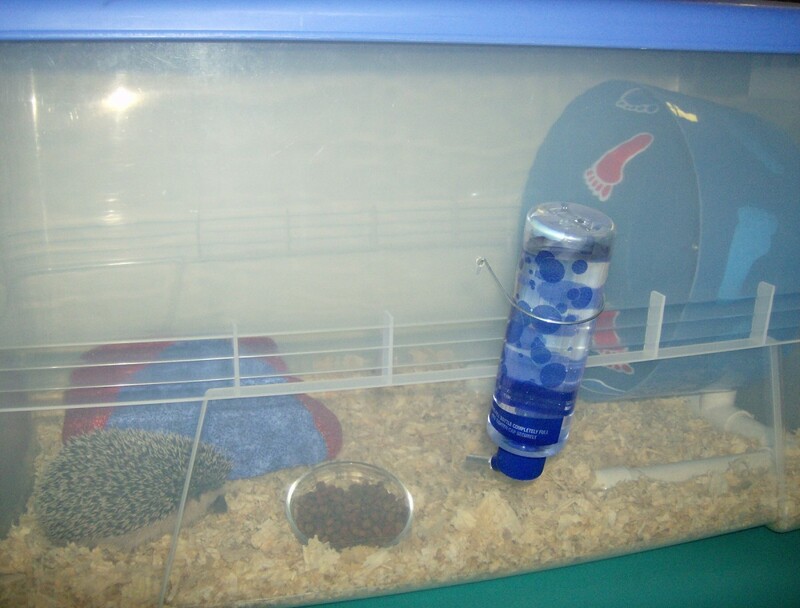 Make sure that the enclosure stays between 72F and 80F, for optimum health of the hedgehog, as they are susceptible to both hot and cold extremes. It's best that the bedding be at least 2" to 3" deep, so that the hedgehog can practice some of the natural digging behaviors. You want to use an absorbent substrate, such as a pelleted substrate or a recycled substrate (such as CareFresh), which can reduce chances of dermatitis. 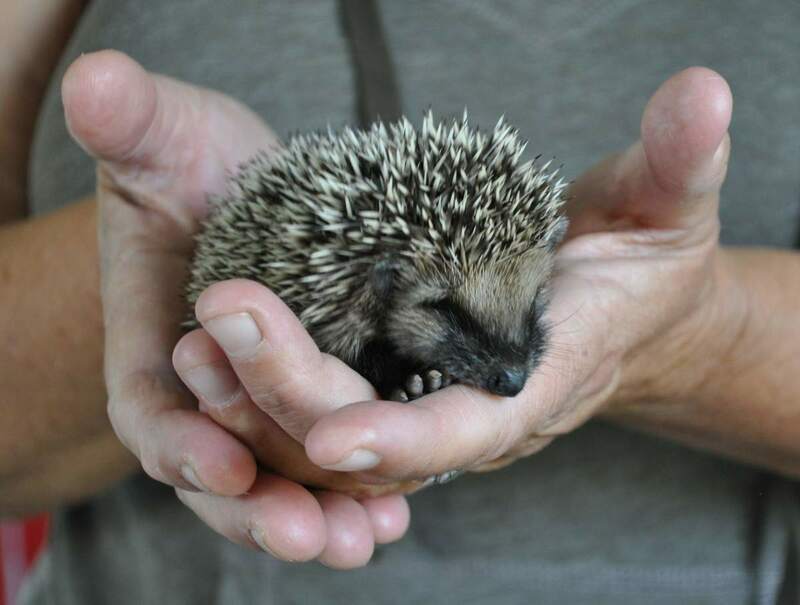 Some breeders will use pine shavings, but it's best that you stay away from both pine and cedar, as they can cause problems with the hedgehog's respiratory tract due to the excess of oils. If you prefer a cheap substrate, you may want to consider aspen shavings. The accessories within the enclosure are just as important as the enclosure size and type. 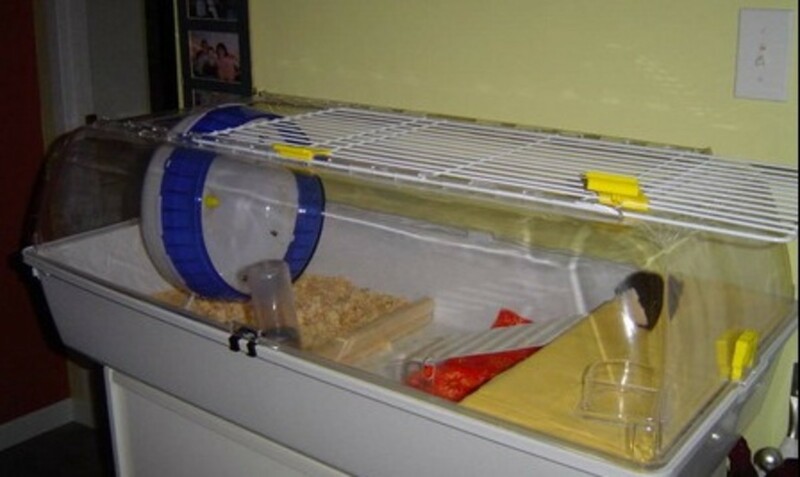 You want to make sure that your hedgehog is comfortable while he's in his cage, since that's where he'll be spending the majority of his time. 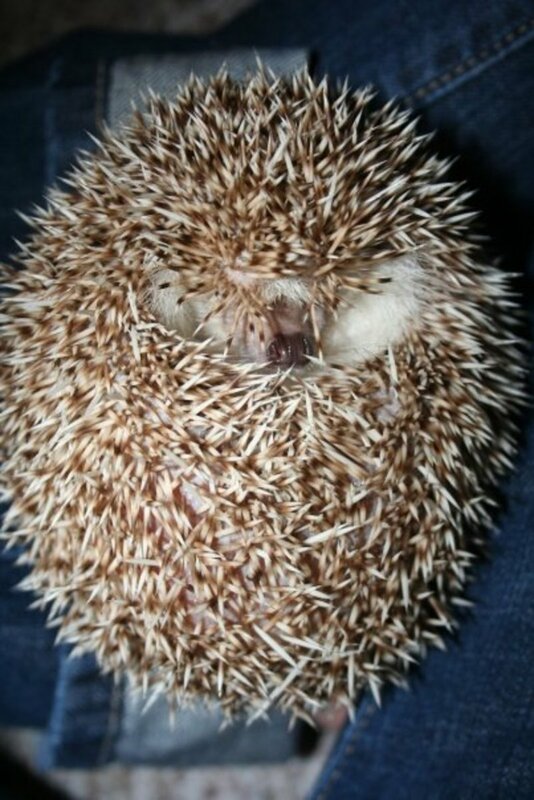 And, since hedgehogs are nocturnal, by providing a good hiding place, you will ensure that he is able to sleep during the day without too many interruptions. You want to make sure that the hiding place is just big enough for the hedgehog to enter and turn around easily. 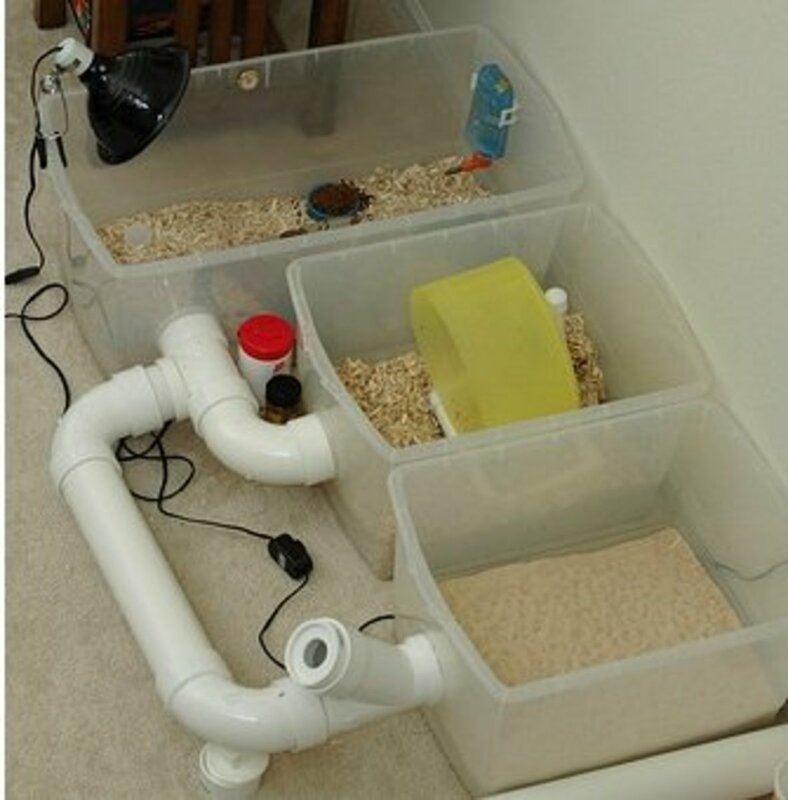 You can use large PVC pipe; but it can be hard to get a reluctant hedgehog out of the pipe, and it can be hard to clean if your hedgehog decides to use the pipe as a potty place. You can purchase a commercial hide, such as the plastic igloos, which are easy to clean and come in large and giant sizes, or you can use cardboard shoe boxes, which need to be replaced every 2-3 weeks. 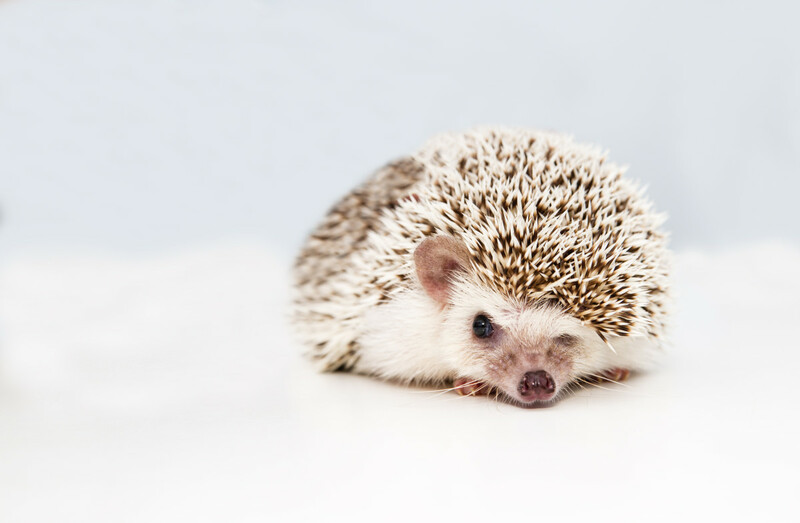 Generally, most hedgehogs will not sleep where they potty, and in some cases, you can even train a hedgehog to use a litter pan in a designated area in the cage. If you opt to litter train your hedgehog, you'll need to make sure there's enough room for the litter pan, which should be at least 2"D x 6" x 9". You can use clay litter, which is readily accepted by hedgehogs, but can cause dust, or you can consider a pelleted, cat litter to cut down dust, although hedgehogs don't accept it as well. 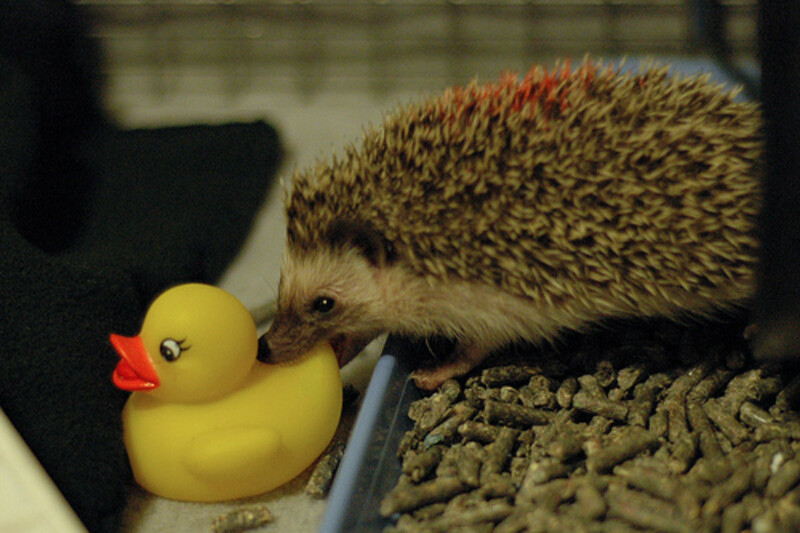 You may also want to consider providing your hedgehog with toys to play with, which will provide mental stimulation and exercise. 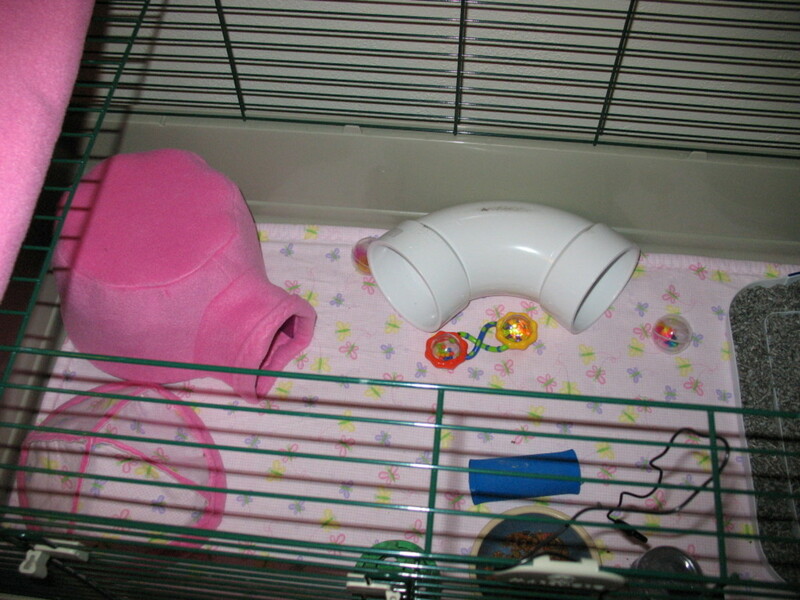 You can include horizontal ferret tubes to run through (never vertical), cat toys such as the balls with bells, and human baby toys that can be pushed around. Just make sure that the toys you you leave in the cage do not have slits or holes in them because hedgehogs can easily get their feet stuck in the holes. You do not want to give your hedgehog plush toys or toys that are made for hamsters, rabbits, or gerbils that are meant to be chewed. 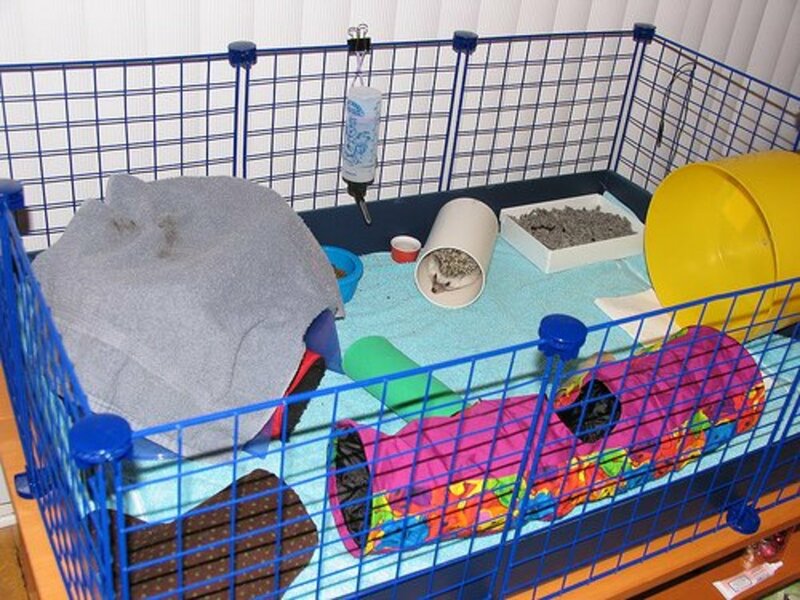 You may also want to add a play pen to your hedgehog's playtime actvities. 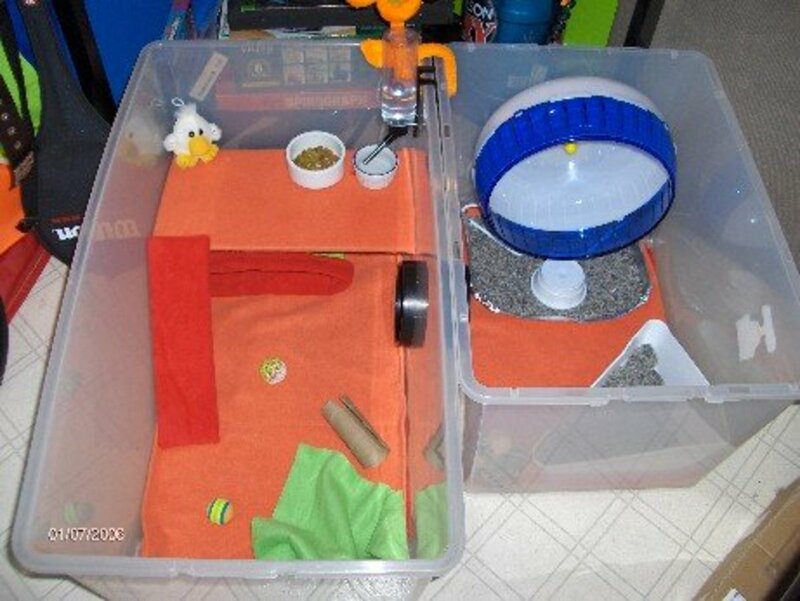 You can use plastic tubs, a bathtub, or another large playpen enclosure to allow your hedghog to have more room to run around, push his toys around and play. Just make sure that the hedgehog can't escape. 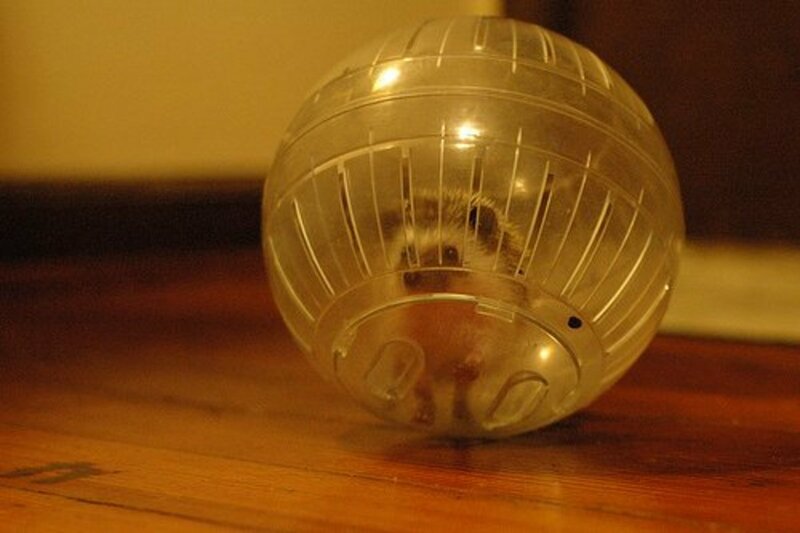 For short periods of time, you can put your hamster in an exercise ball, and let him run around the house. The exercise balls are not substitutes for the wheel, but they are a great way to allow your hedgehog to get some good exercise for an hour or so at a time. 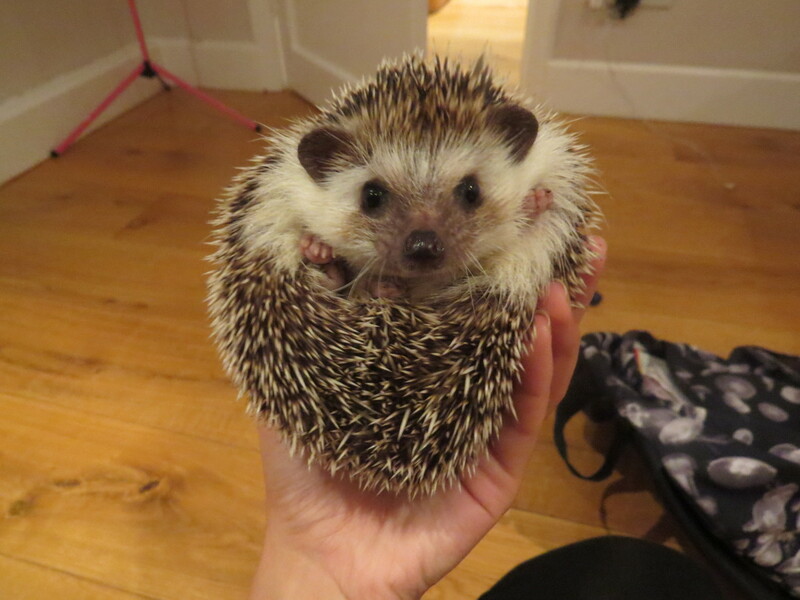 I have a hedgehog name Trinity. She has a wire cube home. I use 6 inches of coraplastic around the bottom so she can not xlimb up and get hurt. Wheels are very important. 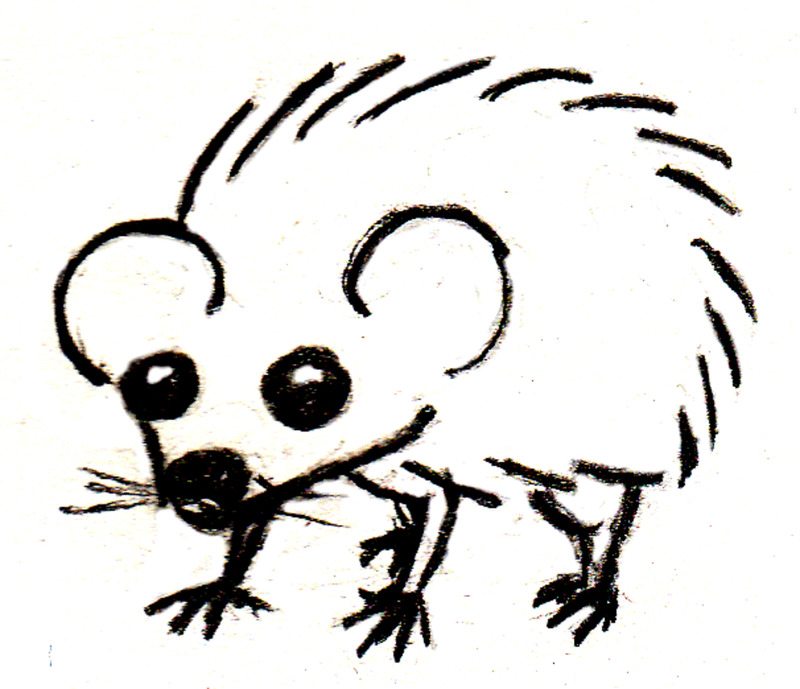 A hedgehog can run ip to 10 miles a night. I use fleece on the bottom and all her cuddle bags and huts are made of anti pill fleece. Trinity is a sweet baby. Most of this information is completely wrong. 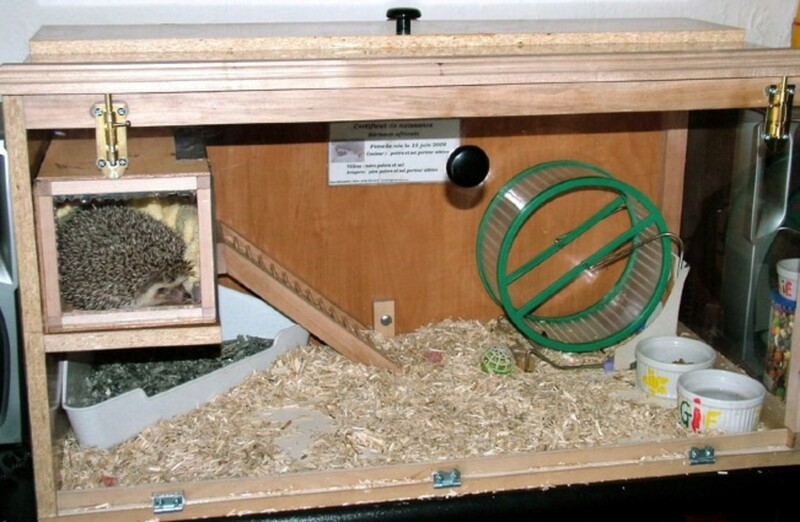 Hedgehogs should live in a Vivarium that's atleast 3ft wide or a zoozone2, wire cages are dangerous they can climb and can fall there has been cases of hedgehogs dying from strangling themselves on the bars. Also hamster exercise balls are not recommended they can hurt there feet! 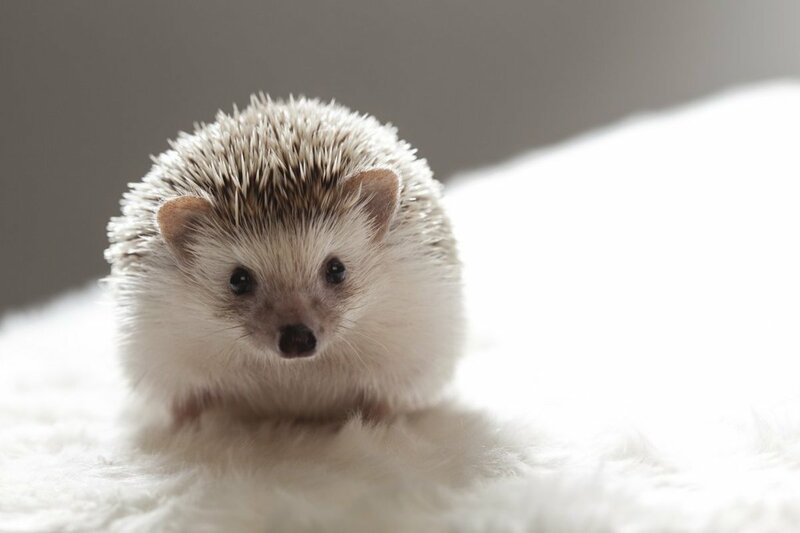 Potty training: I read on another site that although there really isn't a proven method, the best way to start potty training is to start putting the hedgehogs poo in the litter box so the creature starts to realize where its supposed to go. But from what I have learned, there isn't a proven method, and some of them never do. It appears to be a blanket of some sort. what do they put at the bottom of the cage in pic 2? 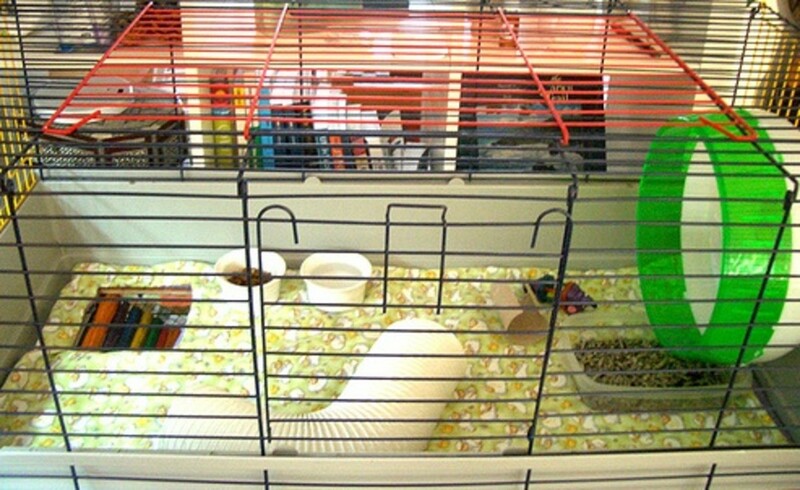 These are definitely great tips for housing a bunny rabbit, as well. Thanks for sharing!